Your financial contributions and in-kind donations help empower and inspire our teens and juniors by funding our programs. Generations Inspired Inc. is a 501(c)(3) nonprofit organization which supports all of I AM BEAUTY charitable programming efforts domestically and abroad. 100% of all public donations go directly to our programs for girls and young women in underserved communities. Every dollar you give will benefit those in need. I AM BEAUTY appreciates the support of the corporations and foundations who believe in and share our goal to provide girls with the necessary life skills and health education that will empower them to lead extraordinary lives. Get some friends together and host a fundraiser! This is a great excuse to bring close friends and family together and it happens to be for a great cause. Bring I AM BEAUTY To Your City or Country! 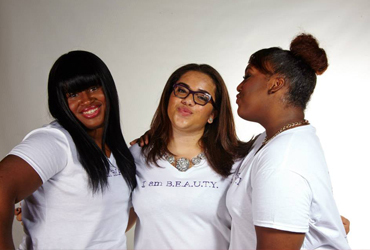 We want all women and girls in the world to have an I AM BEAUTY Experience. We have weekend , half day and 90 minute workshops and coaching options to suit your organization, church , company or personal needs. Contact us today to discus how we can come to you! We know that in order to change the world and have massive impact it will take an army of women. We are developing our Train The Trainer model and looking for trainers passionate about girls and women to expand the movement. Our vision is to have an I AM BEAUTY location on every continent and every major US city. Will you be the difference? We would love to talk to you. Don't see a way to support that works for you? Contact us, we would be happy to share more information about our programs and ways you can support ! Thank you for your interest in the I am BEAUTY movement! We are excited you are here to learn more about changing the lives of girls and women! If you would like to learn more about our organization, feel free to call us at anytime! Since you are here, we assume that you are like us... Passionate and enthusiastic about helping girls and women reach their full potential and just want to get started, so let's get right to it! Getting set up to volunteer with us is as easy as 1-2-3. See... as easy as 1-2-3! We look forward to working with you and invite you to share our information with your friends and family! Check out our current volunteer needs on our application form! If you do not see what you are interested in, let us know because as long as you have passion for girls and women, we have a place for you! We are expanding and need people to accomplish our vision. Are you passionate about creating a world where girls and women are able to walk authentically, love endlessly, seek their passions and live a fulfilled life full of potential? Well, we are too! Inquire about employment opportunities by sending your resume to akilah@iambeautyinc.com.